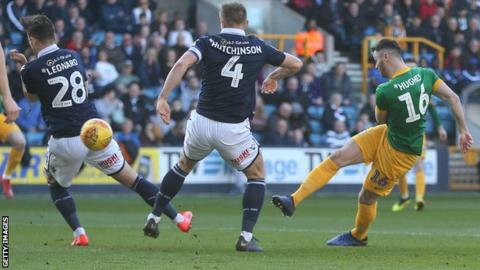 Preston North End scored three goals in the opening 27 minutes at Millwall to extend their unbeaten run to eight games. Andrew Hughes gave the Lilywhites the lead in the third minute when he sent a first-time volley into the bottom corner after the Lions had failed to clear a free-kick. Tom Clarke doubled the visitors' lead with a back-post header from Paul Gallagher's corner, and Sean Maguire then latched on to a Gallagher through ball to dink home and make it 3-0 before the half-hour was up. Ben Thompson pulled a goal back midway through the second half when he smashed home from Steve Morison's knockdown, but the midfielder had a second ruled out for offside as Millwall tried to mount a comeback. Victory moved Preston up to 10th, six points off the play-offs, while Millwall are now four points above the relegation zone after Rotherham drew at Reading. Neil Harris' side had ended a five-match winless league run with victory at Derby in midweek, but the Lions paid the price for their sluggish start. Millwall may have progressed to the quarter-finals of the FA Cup, with a home tie against Premier League side Brighton to come on Sunday, 17 March, but their form in the Championship has been patchy since the turn of the year. The south-east Londoners have scored just three goals in their past seven Championship games, and Thompson's strike was their first home league goal of 2019 in what was their fourth outing at The Den. Alex Neil's Preston, meanwhile, are making a late bid for the play-offs as the Lilywhites recorded their fourth consecutive away league victory - the first time they have achieved that feat in the top two tiers since November 1959. "The second goal was embarrassing. The players didn't do what they were supposed to. We were lacklustre first half - we didn't get out the traps. "The players got a reminder at half-time about what it means to play for this club. You can't give teams three-goal headstarts in this division. I'll praise them for the second half, but not the first. We were terrible. "Preston were good today, but it was more that we were really poor. We let ourselves down. "Hull (on Tuesday) is the third game in six days, so I'll have to think not just about the physical aspect of it, but the disappointing performances of some of the players. I'll certainly take my time in considering my starting 11." "It was one of our best performances, in terms of the first half. I thought we took Millwall apart and we could have scored more than three. The only disappointing thing was second half, we need to show more composure - I thought we tried to turn the ball too much. "I've been saying for a while we're probably one wide player short and I thought that came home to roost today in terms of wanting to keep pace at the top end, because that was hurting them, but also wanting to keep the full-backs in place on the flanks. "If you offered me 3-1 beforehand I'd certainly have taken it because this is a tough venue to come and win. Inevitably when you've got something to protect - and you can hear the (Millwall) fans are really demanding of their team, naturally the players are going to respond and react to that. "We just needed to take a little bit more care, have a bit more incisiveness with the pass, take an extra touch and move the ball." Match ends, Millwall 1, Preston North End 3. Second Half ends, Millwall 1, Preston North End 3. Attempt missed. Jed Wallace (Millwall) right footed shot from outside the box is high and wide to the right. Assisted by Shane Ferguson. Ben Thompson (Millwall) wins a free kick in the defensive half. Attempt saved. Lee Gregory (Millwall) right footed shot from the centre of the box is saved in the bottom left corner. Assisted by Jake Cooper with a headed pass. Offside, Preston North End. Declan Rudd tries a through ball, but Sean Maguire is caught offside. Declan Rudd (Preston North End) wins a free kick in the defensive half. Substitution, Preston North End. Ryan Ledson replaces Brad Potts. Ben Thompson (Millwall) wins a free kick in the attacking half. Jed Wallace (Millwall) is shown the yellow card for a bad foul. Foul by Jed Wallace (Millwall). Attempt missed. Ben Marshall (Millwall) right footed shot from outside the box misses to the right. Foul by Lukas Nmecha (Preston North End). Shaun Hutchinson (Millwall) wins a free kick in the defensive half. Attempt missed. Lee Gregory (Millwall) right footed shot from the centre of the box is close, but misses to the right following a corner. Attempt saved. Jed Wallace (Millwall) right footed shot from outside the box is saved in the centre of the goal. Assisted by Shane Ferguson. Corner, Millwall. Conceded by Ben Davies. Attempt missed. Sean Maguire (Preston North End) left footed shot from the left side of the box misses to the right. Assisted by Daniel Johnson following a set piece situation. Sean Maguire (Preston North End) wins a free kick in the attacking half. Foul by Shaun Hutchinson (Millwall). Offside, Millwall. Jed Wallace tries a through ball, but Mahlon Romeo is caught offside. Attempt blocked. Jed Wallace (Millwall) right footed shot from outside the box is blocked. Assisted by Ben Thompson. Attempt saved. Lukas Nmecha (Preston North End) right footed shot from outside the box is saved in the centre of the goal. Substitution, Preston North End. Daniel Johnson replaces Tom Barkhuizen. Attempt missed. Jed Wallace (Millwall) left footed shot from a difficult angle on the left is close, but misses to the left. Assisted by Shane Ferguson. Delay in match Ben Pearson (Preston North End) because of an injury. Shaun Williams (Millwall) is shown the yellow card for a bad foul. Ben Pearson (Preston North End) wins a free kick in the defensive half. Substitution, Preston North End. Lukas Nmecha replaces Paul Gallagher. Foul by Brad Potts (Preston North End). Attempt missed. Sean Maguire (Preston North End) right footed shot from the centre of the box misses to the right. Assisted by Alan Browne. Corner, Millwall. Conceded by Paul Gallagher.